In the Christmas and Holiday Season aspirations to bake up a storm run high. If you use Pinterest, read Martha Stewart Living or watch the Food Network, you might have visions of baked goods flowing out of your kitchen. Other priorities kick in and before you know it you’re eying up sweeties at Costco the day before guests come over for tea. 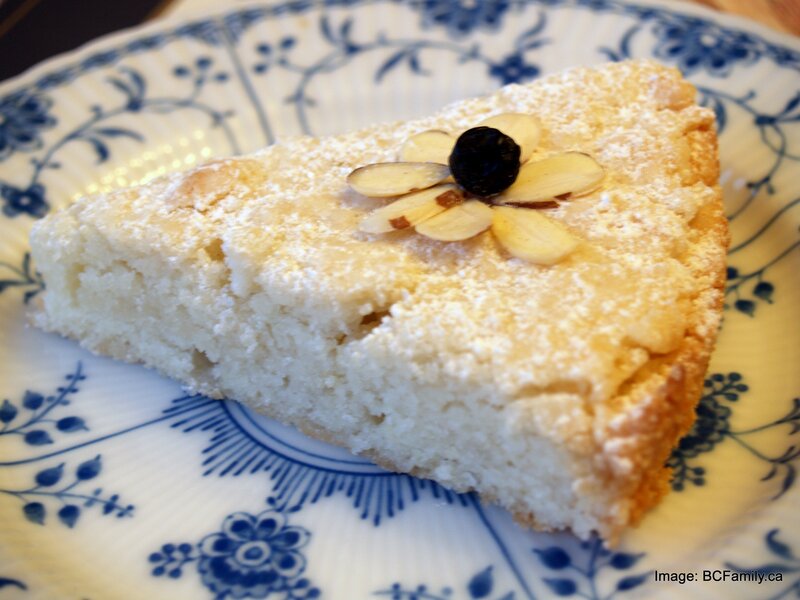 Here is a simple almond cake recipe that you can put together in a flash. It tastes yummy, looks pretty and uses simple ingredients. (Note: It’s always a good idea to stock both vanilla and almond extract in the baking section of your pantry.) This recipe is an altered version of a recipe that was passed on by Jenn R. – a talented mum and marketing executive, on extended sabbatical, who lives in North Vancouver. 2/3 cup coconut oil (Spectrum Naturals organic coconut oil is available in the health food aisle at Superstore.) Use a dry measure scoop rather than a measuring cup, for easier handling. Line a 9 inch spring form pan with oven safe waxed paper or parchment paper. If you do not have a spring form pan, you can use a non-stick, round pan. With an electric beater, beat the sugar, coconut oil, egg yolks and almond extract together until the mixture is smooth and pale in colour. In a separate bowl use clean beaters to beat the egg whites until they form stiff peaks. Fold the egg yolks into the sugar and liquid mixture, ensuring that you mix sufficiently, but don’t over mix. Optional: Add in grated orange and lemon zest to the liquid mixture. If you try the recipe again you can increase the amount to 3/4 teaspoon of each flavour, if you like a more intense result. Try 1/2 teaspoons each to start. The zest isn’t needed to ensure a tasty result. In a separate bowl sift together the flour and baking powder. Add the dry ingredients slowly into the wet ingredients. Fold together until mixed. Do not over mix. Pour the cake batter into the baking tin. Bake for 30 minutes or until light golden brown. Let the cake cool completely before attempting to remove it from the pan. Using a sifter, sprinkle a light dusting of confectioners sugar over the cake. For added interest you could use the President’s Choice snowflake cookie stencils (an affordable investment and available at Christmas time), or a shape cut out of paper. Place the stencil in the middle of the cake before sprinkling the sugar on top. If you have the time, you can also use berries and sliced almonds to decorate the cake slices. Note: if you don’t have a sifter in your kitchen, this is a useful tool to have. You can buy cheap ones at dollar stores. Note: Here at BC Family we do most of our shopping at Great Canadian Superstore because it’s cost effective. This recipe isn’t meant to be a “plug” for Superstore. Just a “heads up” that you can find natural food products there when you go shopping. They are, of course, also available at stores such as Choices and Whole Foods. You could double up the recipe, use two baking pans and add the filling and topping from this Almond Torte recipe. The benefit of the recipe above, versus the one in this link is that it doesn’t require actual almonds ($$$). You can comment about this posting using the comment function below or by visiting the BC Family Facebook page. Your opinion matters so don’t be shy!